Jesse Hagopian and friend Michele Bollinger (editor of “101 Changemakers”and a teacher in DC) leave the award ceremony with Jesse’s two Bammys on Saturday night, September 21, in Washington DC. 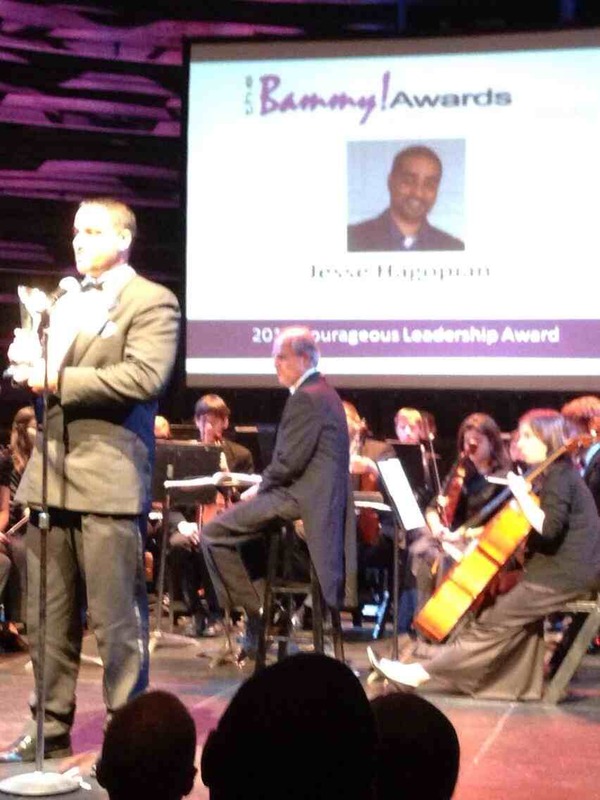 WASHINGTON, DC – Garfield High School history teacher Jesse Hagopian was named “Secondary School Teacher of the Year” on Saturday by the Academy of Education Arts and Sciences International at a black-tie gala in the nation’s capital. In addition to this “Bammy” Award—the “Grammys for teachers”—the academy also presented Mr. Hagopian with a Special Achievement Bammy. He was, of course, referring to the Garfield faculty’s civilly disobedient “boycott” this past school year of the Measures of Academic Progress– a standardized testing instrument known as the MAP test. After Garfield’s faculty refused – without a single dissenting vote – to administer this test, teachers at several other Seattle schools joined the boycott. Near the end of the school year, Seattle schools’ Superintendent Jose Banda relented, telling high schools they were no longer required to use the MAP test. Although Hagopian, a history teacher, was not asked to administer the MAP test, he helped organize with the math, language arts and other teachers for whom the MAP test was a district requirement. Hagopian, worked hard to build support for the boycott around the city and helped to popularize the struggle around the country. Along with teaching history, Hagopian is the Black Student Union adviser at Garfield. He is an associate editor of the acclaimed Rethinking Schools magazine, is a founding member of Social Equality Educators (SEE), and was recipient of the 2012 Abe Keller Foundation award for “excellence and innovation in peace education.” Hagopian is an author, activist, and, since the MAP boycott, an “in-demand” public speaker. Jesse is a contributing author to 101 Changemakers: Rebels and Radicals Who Changed US History (Haymarket Books). Jesse and his wife, Sarah Wilhelm, have two sons, Miles and Satchel. Hagopian is member of Social Equality Educators (SEE), a group of social-justice teachers and education aids that works to build community alliances in purist of quality education, oppose the corporate school-reform agenda, and strengthen the teacher’s union by helping it adopt a social-movement approach to unionism. Social Equality Educators played a vital role in spreading the 2012-2013 MAP test boycott to schools around Seattle, have hosted forums on closing the “opportunity gap” in the Seattle Public Schools, and have staged protests of the Washington State Legislature for its failure to fully fund education. The Bammy Awards honor the contributions of educators in 28 categories across the field. Presenters announced include: Dennis Van Roekel, president of the National Education Association; Marybeth Hertz, executive board member of the Edcamp Foundation; Dan Domenech, executive director of the American Association of School Administrators; Chris Lehmann, founder and co-chair of Educon; Gail Connelly, executive director of the National Association of Elementary School Principals; Angela Maiers, founder of Choose2Matter; Yasmina Vinci, executive director for the National Head Start Association; John Merrow, veteran education reporter at PBS; Donna Mazyck, executive director of the National Association of School Nurses; Tom Whitby and Steven Anderson, co-founders of #Edchat; Caroline Hendrie, executive director of the Education Writers Association. William J. Bushaw, executive director, PDK International Family; Rob Lippincott, senior vice president, PBS Learning Media; and The Northeast Foundation for Children. The 2013 Bammy Awards were held at the Arena Stage at the Mead Center in Washington, D.C., on September 21(st). The awards were co-hosted by Dr. Mark Ginsberg, dean of the College of Education and Human Development at George Mason University, and Errol St. Clair Smith, Emmy-winning correspondent, broadcaster and executive producer of the Bammy Awards. This year’s celebration included a number of special presentations, including lifetime achievement awards to Randi Weingarten and Nancy Carlsson-Paige, special achievement awards to the founders of Edcamp and #Edchat, a special Bammy presentation to educators from Sandy Hook Elementary School, a salute by the BAM 100 celebrating connected educators, Bammy Awards for the best in education technology, and a very special Bammy Award honoring a truly exceptional student. “The Bammy Awards were created in response to the relentless national criticism of America’s public schools, while all that is right in American education is largely ignored,” said Errol St. Clair Smith, Bammy Awards executive producer. Modeled on the broad scope of the Oscars, Grammys and Emmys, the Bammy Awards were created to be a cross-discipline honor celebrating the entire education village. The Academy is comprised of over 212 prominent education leaders, including Linda Darling-Hammond, professor of education at Stanford University; Diane Ravitch, former Assistant Secretary of Education; Timothy Shriver, CEO of the Special Olympics; and the executive directors of NAESP, AASA, PTA, NASN, ASBO and NASSP.